If you read my last post, you either chose to collaborate in the conceptual art I'm creating, or you chose to observe. You can collaborate by trying to imagine the conceptual picture I'm trying to 'paint', and by trying to discover how the picture you're seeing is [different from / same as] the picture I'm seeing. What was your first impression of the previous excerpt from the scifi novel I'm writing? It was [crap / brilliant]. Renice must be [crazy / high]. I was [bored or confused / intrigued or enlightened]. Drawing Hands, M.C. 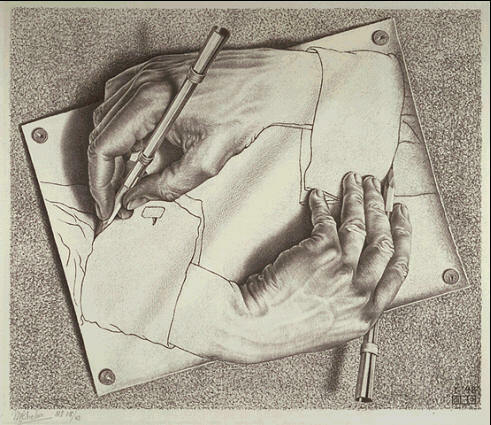 Escher, 1948, lithograph, © 2007 The M.C. Escher Company, the Netherlands. All rights reserved. Used by permission. Read more about M.C. Esher at www.mcescher.com. By the way, happy spring! or, if you use a lunisolar calendar, happy NEW YEAR!